Hi, when shooting tethered there are so many options for file naming, but the one I can't see is to keep the exact original name from the camera. How do I do this? Few weeks ago I was playing with tethered shooting and noticed the same. (I have Fuji GFX 50S so this is how it works with my camera, it maybe different with yours). 1. When connecting camera through the tether to my computer, my computer recognizes it and mounts it on the file system as "GFX 50S" Portable Devices (no drive letter is assigned to it). 2. That exposes two folders inside: "Live" and "Still"
3. Every time I take a picture, a new file appears in the 'Still' folder. 4. The file naming convention in that folder is not the same as the file names when storing the file on to SD card. a. When I press the shutter the first time, the file is always named the same: "DSCF0001.raf". 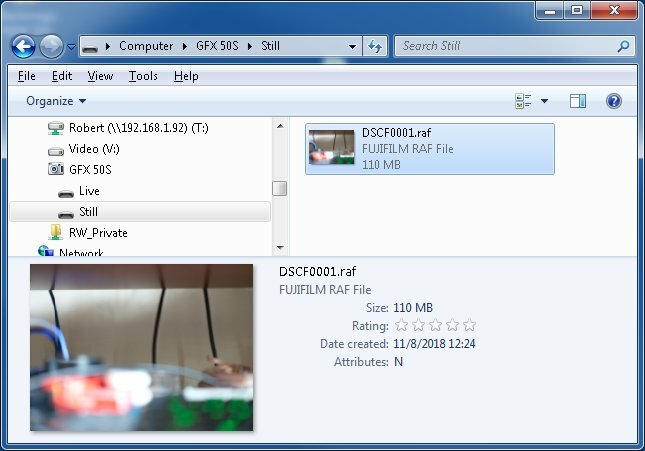 My in camera to SD card file naming convention is "RW010884.RAF". b. If I press the shutter again before the computer has the chance to read & move the first file, the next file will be "DSCF0002.raf"
c. The file names will continue to count up until the folder is empty by moving all those files of the camera (it makes sense when taking a burst of pictures). d. When you stop taking pictures and allow the computer to catch up (empty folder), the next picture will be back to "DSCF0001.raf"
e. The camera will stay ON as long as there are files in this folder. So if one turns the camera off and it stays on, disconnect the USB cable and the camera will then shut down, but the files not downloaded will be lost. So in my opinion: There is no way for C1 to know your file name when tethered. You could re-create the naming of the camera. To mimic Nikon for example in the name field type _DSC immediately followed with the 4 digit counter token. Set the counter to which ever number you need for a starting point.